For years, I've been trying to get a good picture of a loon on a lake in the Upper Peninsula, and I finally did it the other night in the Sylvania Wilderness Area near Watersmeet. It was a matter of taking my time, and doing some soft paddling in my kayak, so as not to scare the bird. Loons are ground nesting birds and this time of year, a lone male loon in the lake means there is a female on a nest not too far away. The job of the male is to attract the attention of possible preditors to keep them away from the nest, so the mother isn't disturbed. 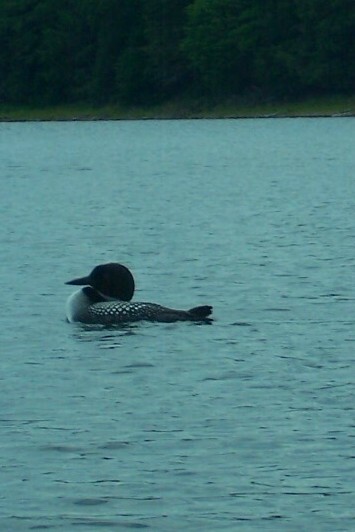 Male loons will dive underwater to get away from you, and this one did seconds after the picture was taken. I feel lucky to have seen this one this close.